If you are in Bloomsbury between now and 15th December do make a detour into the 1937 Art Deco magnificence of Senate House on Malet street to see this small but marvellous exhibition about The Reformation hosted by Senate House Library. 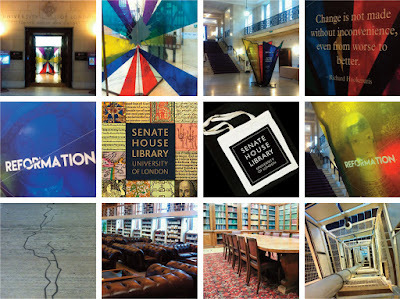 The two pics at the centre show a marvellous book about the library and a tote bag, both available there. The middle two pics on the bottom row show library rooms and the the one bottom left is of the stairwell (see more below). The exhibition is not advertised outside but is well signposted once you enter the main building by following the motifs designed to resemble smashed stained glass and cracked stone which lead up to the 4th floor. I was lucky when I visited for a preview of this exhibition to gain access to the roof of the tallest part and the pic at bottom right (above) shows a view from the top of the stairwell looking down approx 60metres and would have been quite dangerous for the maintenance men changing the lightbulbs etc – a potentially deadly drop. Luckily the stairs are caged on all sides now. I will post some views from the roof next week. Yes, the exhibition – it's free! Charles Holden's Art Deco Senate House was London's first skyscraper and is worth a visit in itself. This is where George Orwell found his inspiration for Nineteen Eighty-Four and Room 101.